For 11 months of 2018 in the wallets actively trading Ethereum-whales appeared more coins than in any other period in the history of the third by market capitalization crypto-currencies. This is stated in the study Diar. Diar data show that by the end of November the large holders of Ethereum was 80% more coins than in January. 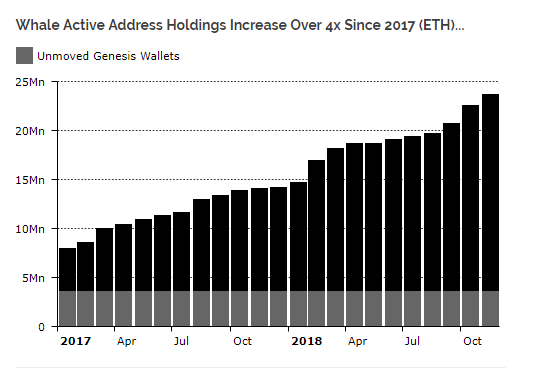 At the beginning of 2017 in the wallets of whales there were 5 million ETH, a year — 11 million, and by December 2018 — 20 million (20% of all in circulation coins). According to the researchers, the whales increased their holdings due to the fact that a significant number of traders left the market Ethereum tokens. At the same time, analysts say, from January 2018, the number belonging to the whales Ethereum addresses has dropped by almost 30%. We will remind, according to the September survey Diar, whales keep more than 55% of all bitcoins.